Among the reasons given in support of payday loans — short-term, high-interest loans intended to get the borrower through to the next paycheck — is that they ultimately provide a net good to the economy, allowing the borrower to keep spending and earning interest for the lender. But a recent report casts some doubt on that belief. According to a recent white paper [PDF] from the Insight Center for Community Economic Development, the huge fees — the Consumer Financial Protection Bureau calculates the average APR on a payday loan is 392% — may make billions for lenders, but would be better for the economy if spent elsewhere. The economic activity generated by payday lending firms receiving interest payments is less than the lost economic activity from reduced household spending. Specifically, each dollar in interest paid subtracts $1.94 from the economy through reduced household spending while only adding $1.70 to the economy through spending by payday lending establishments. As a result, for each dollar of payday lending interest paid, an estimated 24 cents is lost to the U.S. economy. For example, a payday loan that carries an interest payment of $40.00 causes a loss of $9.60 — nearly one-quarter of the fee — from the economy. The researchers calculate that for 2011, during which payday lenders took in an estimated $3.3 billion in interest, the net loss to the U.S. economy was $774 million, as household spending tends to outpace spending by payday lending businesses. Additionally, the report states that these loans resulted in $169 million worth of Chapter 13 personal bankruptcy filings in 2011. The Insight Center figures that around $80 million alone went to payday fees instead of doctors, hospitals, healthcare, medicines, nursing care and other medical needs. Another $9 million that could have been spent on groceries for households went unspent by payday lenders, concludes the study. California was by far the state with the largest net loss, say researchers, who calculate that payday loans resulted in a loss of $135 million for 2011. Texas took the second biggest hit with a net loss of $95 million, followed by Florida ($76 million), Mississippi ($61 million), Illinois ($55 million), and Alabama ($48 million). This redirection of household income also has an impact on jobs, according to the Insight Center researchers. Nationwide, the study claims that 14,000 more jobs would have been created if payday borrowers had spent the money paid in fees on regular household expenses instead. 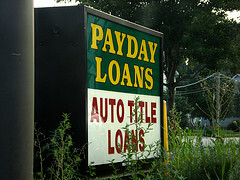 The Insight Center report comes at the same time as a white paper from the Consumer Financial Protection Bureau, which found that even though payday loans are marketed as short-term solutions, that many borrowers find themselves caught in revolving doors of having to take out another loan to pay back the previous loan. The CFPB found that the average payday borrower spends six months of the year in debt to the lender, and that the median borrower takes out 10 loans every 12 months, with a full one-third of borrowers taking out between 11 and 19 loans each year. Payday loans are illegal in more than a dozen states. Many consumer advocates have called for regulators to put an end to the practice altogether or to rein in interest rates and fees to levels where the borrower does not require multiple loans to get back to square one. Payday lenders have defended the practice by saying it provides a necessary service to lower-income households who need an immediate cash infusion. This may be true, but as the CFPB report shows, lenders rely on repeat borrowers for the overwhelming majority of their revenue, with more than 75% of fees coming from borrowers taking out at least 11 payments in a year.